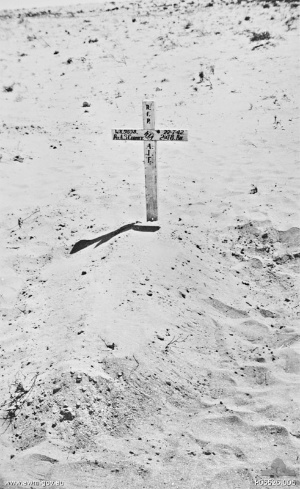 To conclude my previous post on Egypt’s V.C burials we shall now look at the holders of the remaining five awards cited during the course of the Western Desert campaigns of WW2, the recipients being three members of the Australian Infantry, a member of the Durham Light Infantry and a member of the General Staff. 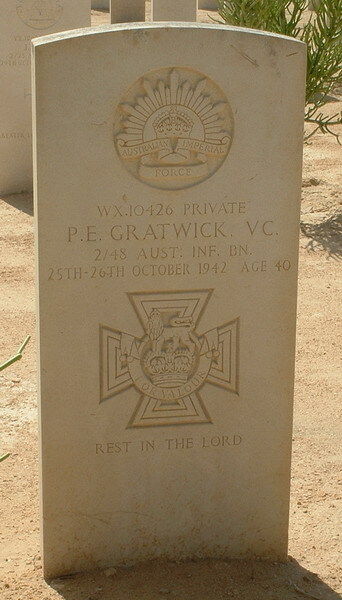 Percival Gratwick joined the 2/48th Battalion of the Australian Imperial Force and served in Egypt and Libya during the North African campaign. On the night of 25th/26th October 1942, his unit attacked German positions on the Miteiriya Ridge. The platoon took heavy casualties and, with no regard for personal safety, he charged several German positions, saving the other men and enabling the capture of their objective. Sadly he was killed in the fighting and posthumously received the Victoria Cross. 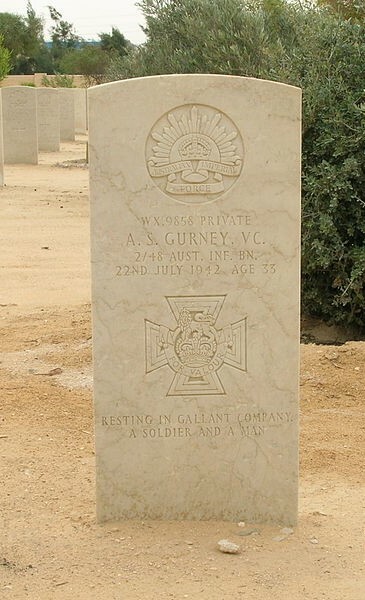 Arthur Gurney was 33 years old, and a Private in the 2/48th Battalion A.I.F when he was posthumously awarded the VC for his actions during the first Battle of El Alamein at Tel-el-Eisa, Egypt. The battalion were subjected to intense machine gun fire inflicting heavy casualties which included most of the Units command structure. Private Gurney, realizing the seriousness of the situation, charged the nearest machine-gun post, silencing the guns and bayoneting three of the crew. He bayoneted two more at a second post before a grenade knocked him down. Picking himself up, he charged a third post and disappeared from view. Later, his comrades, whose advance he had made possible, found his body. Private Gurney’s medal group, including his Victoria Cross, is on permanent display at the Australian War Memorial. William Kibby was born in County Durham, England. In early 1914, the family emigrated to Adelaide where Bill attended Mitcham Public School. After leaving school he was employed at a Plasterworks where he designed and fixed plaster decorations. In 1926, he married Mabel Sarah Bidmead Morgan and had two daughters. Although diminutive in stature William was a strong man who loved outdoor activities. 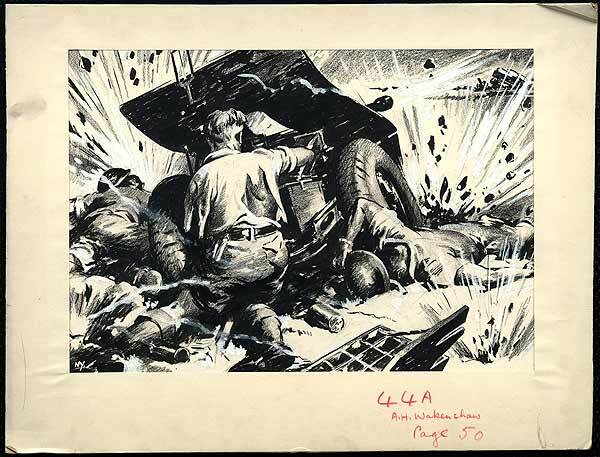 William joined the A.I.F during Second World War. In 1942 and served as a Sergeant with the 2/48th Battalion during the campaigns in North Africa. 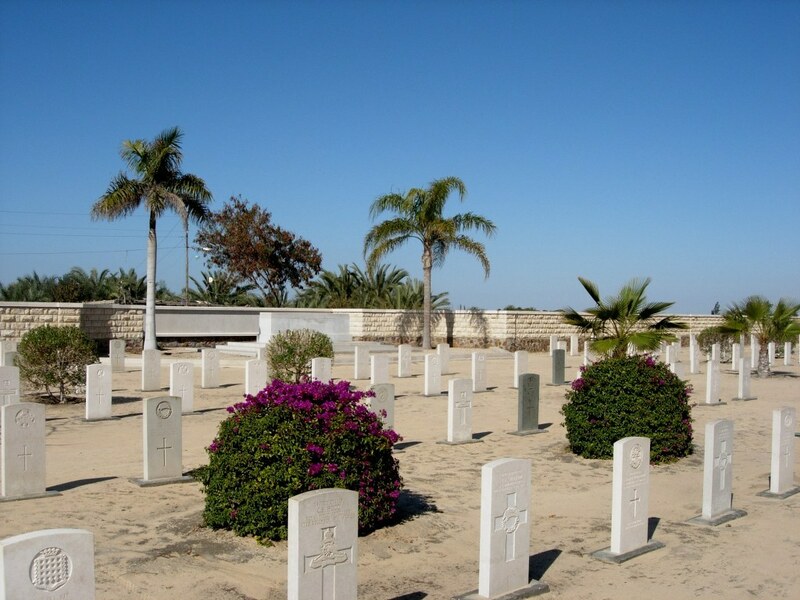 In 1942 during the October phase of the Battle of El Alamein William distinguished himself through his skill in leading a platoon after his commander had been killed during the initial attack at Meteiriya Ridge. On 23 October, he charged a machine gun position killing three enemy soldiers, capturing 12 others and taking the position. His company commander intended to recommend him for the D.S.O after this action, but was killed. During the following days, Kibby moved among his men directing fire and cheering them on. He mended his platoon’s telephone line several times under intense fire. On 30–31 October, the platoon came under intense machine gun and mortar fire. Most of them were killed or wounded. 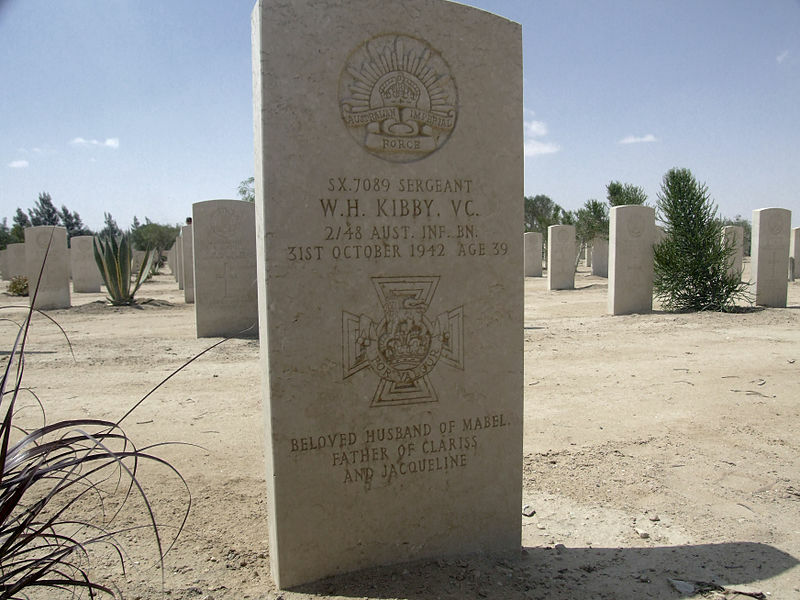 In order to achieve his company’s objective, Kibby moved forward alone, to within a few metres of the enemy, throwing grenades to destroy them. Just as his success in this endeavour appeared certain, he was killed. 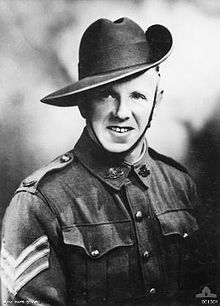 His Victoria Cross was awarded posthumously and is displayed at the Australian War Memorial. In 1942 Private Wakenshaw was fighting in North Africa as part of a DLI anti-tank gun crew when enemy guns came within range. They attempted to destroy Wakenshaw’s anti-tank gun in order to advance and attack the British Infantry. The first German gun’s progress was stopped, but a second German gun killed or seriously wounded the DLI crew, including Wakenshaw, who lost his left arm. Despite this, he managed to fire five rounds and halt both German guns, before he was killed by a direct hit. His actions gave the nearby British Infantry enough time to safely withdraw, and for his self-sacrifice he was awarded the Victoria Cross. Major General Campbell was born in Thurso. Commissioned into the Royal Horse Artillery he became a career soldier, joining the Royal Horse Artillery and became a first class horseman, excelling in both polo and hunting. 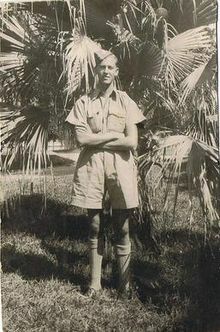 When World War II started, Campbell was 45 years old and a major commanding a battery in the 4th Regiment Royal Horse Artillery in Egypt. 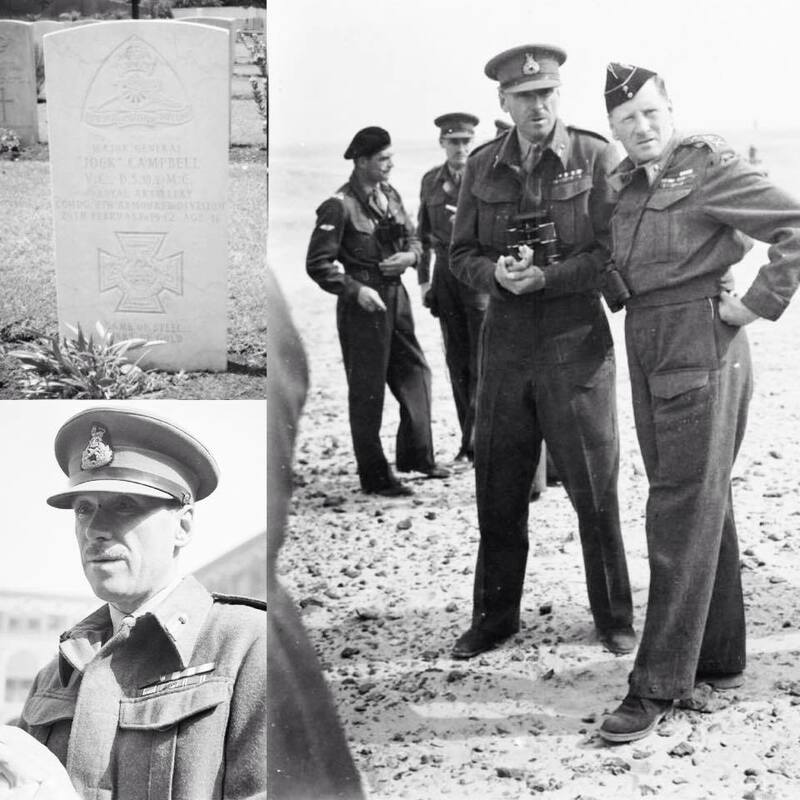 When Italy declared war in June 1940, Campbell, by then a lieutenant-colonel, was commanding the artillery component of 7th Armoured Division’s Support Group under Brigadier William Gott. The British Army was heavily outnumbered by the Italians, so General Archibald Wavell formulated a plan with his senior commanders to retain the initiative by harassing the enemy using mobile all-arms flying columns. Campbell’s brilliant command of one of these columns led to them being given the generic name “Jock columns” (although it is unclear if the idea originated with Campbell or not). During Operation Compass Campbell’s guns played an important role in 7th Support Group’s involvement in the decisive battle at Beda Fomm in February 1941 which led to the surrender of the Italian Tenth Army. In April 1941 Campbell was awarded the DSO. In February 1942 when Gott was promoted to lead XIII Corps Campbell was promoted to the rank of Major General and given command of 7th Armoured Division. He was killed three weeks later when his jeep, driven by his Aide-de-Camp, Major Roy Farran overturned on a newly laid clay road surface. Major Farran, who was thrown clear in the process, later admitted that he had considered suicide whilst awaiting rescue. 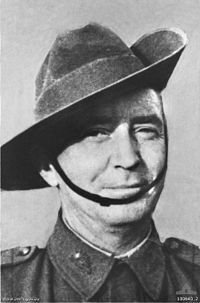 During the Western Desert Campaign Campbell was considered to be one of foremost commanders in the Eight Army, an old desert hand who had been in North Africa from the start of the war. His loss was deeply felt by the soldiers of the Eighth Army.